The just-released Kovels on Antiques and Collectibles March 2016 newsletter features miniature room boxes, 18th- to 20th-century American “brown” furniture bargains and antique Griswold cast-iron cookware, all with information, photos and prices. Also included is a special feature article by Terry Kovel on the eccentric birds made by the Martin Brothers of England. Victorian-style room boxes auctioned in Ohio are featured in a sale report in Kovels on Antiques and Collectibles March 2016 newsletter. See pictures and prices of small boxes with detailed furniture, moving parts and tiny occupants that brought up to $750 each. Cooks love cast-iron pans, the older the better. A large collection of cast-iron household wares auctioned in Pennsylvania, and Kovels’ March newsletter pictures a selection of Griswold cookware that sold from $23 to $1,300. Skillets, baking pans, even a tea kettle and waffle iron, are included, along with information on their marks and prices. The current low prices for quality antique American “brown” wood furniture pieces are giving collectors and buyers furnishing a room opportunities for bargains. A recent Ohio auction had lots of choices and most sold well under $1,000. Kovels’ latest newsletter pictures some of the more rustic or country style pieces with descriptions and prices. Kovels’ March issue includes a special feature by Terry Kovel on her lifelong hunt for one of the stoneware birds made in England by the Martin Brothers from 1873 to 1914. The fanciful figures are eccentric and when offered, prices soar over estimate. The popular illustrated Collector’s Gallery answers readers’ questions about a stoneware jug, bride’s bowl on a silver-plated stand, a lamp shaped like a policeman and ceramic cow figurines. March’s Dictionary of Marks focuses on lesser-known Mexican jewelry makers. And more than 70 antiques and collectibles are listed in the Buyer’s Price Guide. 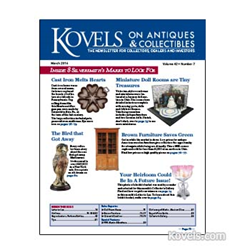 Kovels on Antiques and Collectibles is available as a print subscription or as a digital version that is part of the Kovels.com Premium subscription. Terry Kovel is America’s foremost authority on antiques and collectibles. She is the well-known columnist and author of more than 100 books on antiques and collecting. With her daughter, Kim Kovel, she co-authors the best-selling annual Kovels’ Antiques and Collectibles Price Guide. The 2016 edition is now available at Kovelsonlinestore.com and local bookstores. They will discuss antiques and collectibles topics with accredited media. Photographs are available. Contact pr(at)kovels(dot)com.